This children’s book comes after a series of five other books about Stick Dog. However, I’m not a dog fan, so I never picked them up. Judging by this one, however, the others are probably quite fine as well, if you love dogs. 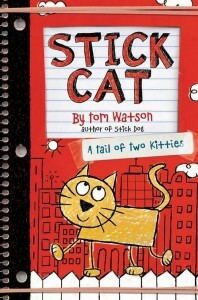 In this book, we see the world through a very intelligent cat and his not-so-intelligent cat neighbor. There is lots of humor, and some action that is sure to stretch belief. But it makes for a great little story. I think the best part of this kind of children’s book is that it is easily read by a young and possibly struggling reader. The pages are drawn as if they are written on lined paper, the print is quite clear, and there are imaginative stick-figure drawings to keep you interested. I think it’s a great format for emerging readers to work with. It’s not ‘great literature’ but as a children’s book, I think it adds a lot to the genre of easy-to-read books that will help keep children reading. I would definitely add it to a school or home-school library, if there are second and third grade children who need encouragement to read. If you enjoy this one, then check out the Stick Dog series as well.